Just like it sounds. Recipe perfected by Brian Bernhardt & Kate Clarke. Pour milk into stainless steel pot. Heat pot over low heat to 100 F, whisking occasionally. 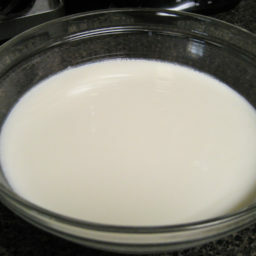 Go ahead and whisk in the old yogurt (make sure to break apart any clumps). I use five tablespoons per half a gallon. When the temperature gets barely to 110 F take the pot off the heat and immediately pour into the glass jar and close tightly with lid. Wrap the jar in whatever combination of insulating materials is available. Coolers, clothing, blankets, and sleeping bags all work well. Wait a minimum of 8-12 hours. Take the jar out (hopefully still warm) and put it in the fridge to sit for several hours. We suggest placing jars of hot water inside a cooler, alongside the container of yogurt.